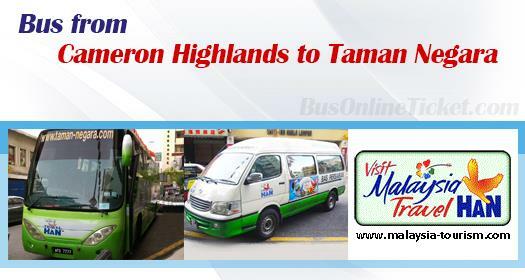 Bus or minivan is the only transportation option from Cameron Highlands to Taman Negara located at Kuala Tahan. The journey for Cameron Highlands to Taman Negara has two portions, namely the land journey and river journey. The land journey takes about 5.5 hours by bus from Cameron Highlands to Kuala Tembeling and river journey takes about 3 hours by boat from Kuala Tembeling to Taman Negara. Hans Travel is the only famous operator serving bus from Cameron Highlands to Taman Negara. They provide daily departure at 8:00 AM from Cameron Highlands to Taman Negara. The departure point is at Tanah Rata, Eco Cameron Travel & Tours. The estimated journey for bus from Cameron Highlands to Taman Negara breakdown as follows. Total duration of the journey is about 9 hours. It has a lunch stopover at either Gua Musang or Kuala Lipis. The fare for both bus and boat inclusive service is RM 95.00. Taman Negara is a heaven for natural lovers. Every year millions of visitors flock to Taman Negara to explore the nature. Now it is even more convenient by booking your ticket online with BusOnlineTicket.com. Save yourself the time and effort of searching for each individual company and their routes and rates by booking online with BusOnlineTicket.com. We guarantees that you will pay the same fare as you would if you booked directly and you even stand to save money as we negotiate better rates.